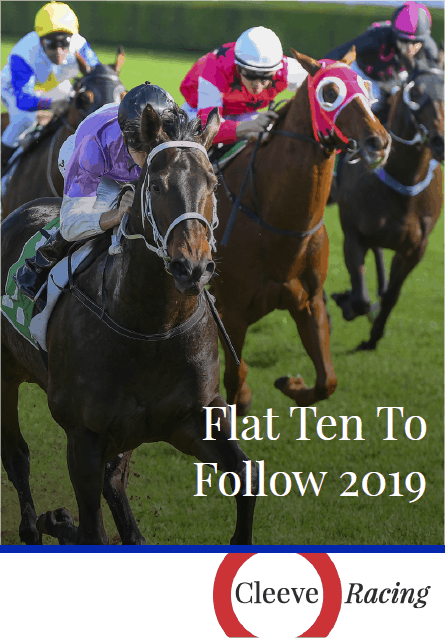 We've had a lot of success over the years with the 10 to Follow lists, both over Jumps and on the Flat, and with the Flat Season just about ready to hit full stride I thought it was about time I published the latest group of horses I'm hoping will pay their way over the coming Season. The list comprises of 10 Handicappers of all ages that come from a number of different stables, big and small, and should be running over a wide range of trips. For a variety of reasons they all now appear to me as being well handicapped. You can download a pdf copy of the 10 at the bottom of the post. ....Or load them up in your favourite horse tracker. ..........Or, of course, ignore them! Won his first two career starts but hasn't troubled the judge in 11 runs since. He ran last of the 13 runners in the London Handicap at Newbury last May behind Defoe and is just about the only horse to come out of that race and not win a race subsequently. He was gelded last Summer and was pretty consistent afterwards with plenty of placed efforts on various surfaces and ground conditions. He made his Seasonal debut last Saturday but finished last of 5 but all the while his rating has been slipping and if he gets dropped another couple of pounds after his disappointing first effort this year he'll be on a very dangerous mark. A 10f handicap looks his for the taking. Won a Brighton maiden on his third start as a juvenile by a very wide margin and began his 3yo career with a 3/4 length 4th to subsequent Royal Ascot winner Atty Perrse at Sandown giving that rival 5lb. That should have been a springboard for a great Season for Hugo Palmers colt but after running midfield in the Britannia Handicap at Royal Ascot he disappointed in two further races that Summer. He was gelded in September and had one more race that Season where he finished 3rd in a handicap in heavy ground at Haydock from a rating of 89. He gets to start this Season from the same mark and looks one to catch first time up on slightly better ground. Had a fantastic second half of the 2016 Season as a 4yo winning 4 times and being sent off 7/2 favourite for the Ayr Bronze Cup. He wound up the year winning an Irish sprint handicap from a rating of 89. His trainer had high hopes for him in 2017 mentioning that on soft ground he thought he'd be able to bag a Stakes race with him and he began the next Season racing off 95 but after a succession of poor runs he dropped through the ratings to end the year getting beat at Pontefract by 81 lengths off 82. There were major excuses that day but not so many for his two defeats already this Season. It does mean he now gets to race off a lowly mark of just 77 and that could just trigger a return to form for a horse that big things were expected of once upon a time. Promising 3rd in one run as a juvenile and fulfilled that promise when scoring in an all weather maiden and all weather handicap on his first two starts in the Spring of last year. Switched back to turf he ran 4th at Goodwood before being hampered and running down the field in the Britannia Handicap at Royal Ascot. A return to the all weather at Newcastle saw him run a close second before a disappointing second last in a decent York handicap at the Ebor meeting. He's been dropped 5lb on turf but his rating has gone up 1lb on the all weather where all his best form has been. He's not run that many times on turf and there's still time for him to shine in that sphere from a career low rating but it's the all weather where he looks handicapped to win a decent race. Just the one run as a 3yo resulted in a very impressive Thirsk maiden win from a highly rated rival. A couple of small problems kept him off the track until late July 2017 but such was his reputation he was sent off the 7/2 favourite for a York handicap. He was a promising near 4 length 6th of 10 from a rating of 93 that day but unfortunately that was to be the highlight of his season as in 5 subsequent runs he beat just 9 horses home and finished last on 2 occasions. He starts this season from a perch of 82 and if he is able to recapture just a little bit of the form of that Thirsk maiden win he'll be very dangerous in handicaps this Season. Won a maiden on his second start but was outclassed in the group 2 Superlative Stakes next time out behind current 2000 Guineas favourite Gustav Klimt. Back down in grade for his next start he just got home to land a handicap off 83 from a subsequent handicap winner. Maksab ran another 3 times in class 2 handicap company that season and although not disgraced was unable to add another win. He began this Season running third in a 15 runner class 4 handicap at Newmarket (2nd of 7 on his side) having quickened up and gone for home a little too early. He gets to race off just a 1lb higher mark of 84 next time out and that looks a rating he's more than capable of winning from. Maiden at 2 after two starts but won first time up as a 3yo when making all to land a Salisbury maiden in fine style. Went to Haydock for a handicap on his next start and looked all over the winner as he closed up on the bridle but was outstayed by a decent Mark Johnston horse and finished second. He was beaten again on his next two starts on ground softer than ideal and then rounded off his season getting beat on the all weather. He's back down to the same mark he began his handicap career on and looks capable of winning once he gets firm ground. A Godolphin colt with a big reputation he was sent off at odds-on for his debut but could only manage 7th. No mistake next time out when winning a Newbury maiden from a decent Stoute horse he was then put away for the year. He reappeared in the Dante the following May but after running down the field he wasn't seen again until October where he finished 3rd of 5 from a rating of 89. Down to 86 he finished last of 8 when fancied for a Newmarket handicap the following month and that was the last we saw of him. He gets to start 2018 off 84 and with plenty of time on his side this lightly raced colt can finally start to fulfill the promise of that Newbury maiden win. Multiple handicap winner as a 3yo including the Newmarket Cambridgeshire at the end of the 2015 Season. Struggled with a rating in the 100's for the next two Seasons but handicapper has finally relented and he's now down to 93. Two starts back he ran 3rd in a class 2 AW handicap (off 95) and last time out was a running on 6th in the Spring Cup (off 95). Coming back into form and from his revised mark he should be able to pick up a decent handicap at around a mile this Season. Ran some great races in defeat early Season behind various Group race performers but took a few runs to find his form again after being gelded mid-Summer. He ran 5th in a big field sales race at the St Leger meeting over 6½f looking in desperate need of a step up in trip and that was also evident in two subsequent handicap runs over 6f. On his last run of the Season he finally got to race over 7f but had the misfortune to run into a potential Group horse racing off just 88. He stayed on well and got within 3½ lengths of the winner in second but the difficulty of his task that day was emphasised by the winner being raised 15lb to 103. He looks one to look out for in 7f-1m handicaps this Season.